The futureproof venue is a place that delivers total fan engagement and leverages technology to achieve this goal. Teams and properties need to think creatively about how to make their venues exciting today and relevant to their communities tomorrow. To do this, questions around designing an experience that entices fans off the couch, keeps them safe, and engages them in a meaningful way should be considered early and often. Entertainment districts are rising to the challenge by creating spaces designed for multiple sports and events. Venues further strengthen their durability by enmeshing themselves in the city around them through mobility and connectivity initiatives. If the fan is going to spend the time, money, and effort to get to the venue, they want to experience something they can’t be missed. They want to feel like they are part of something larger than themselves. Venues can deliver this by embracing their role as innovation hubs for emerging technology. As a member of the PyeongChang Olympic Coordination Commission, our project began in 2011. In the 7-year span from kick-off to completion the world around us changed dramatically. Globally, internet access grew from 2 billion people in 2011 to 4 billion today. This change was reflected in the 670 million people who watched the Games online, a 120 per cent increase from Sochi 2014. As applications on the Google Play store increased from 30,000 in 2010 to 3.5 million in 2018, mobile applications became the new way to access services such as ticketing and mobile ordering. Behind the scenes, the evolution of cloud computing started to provide an easy to manage, scalable infrastructure resource which allowed companies to process large amounts of data. 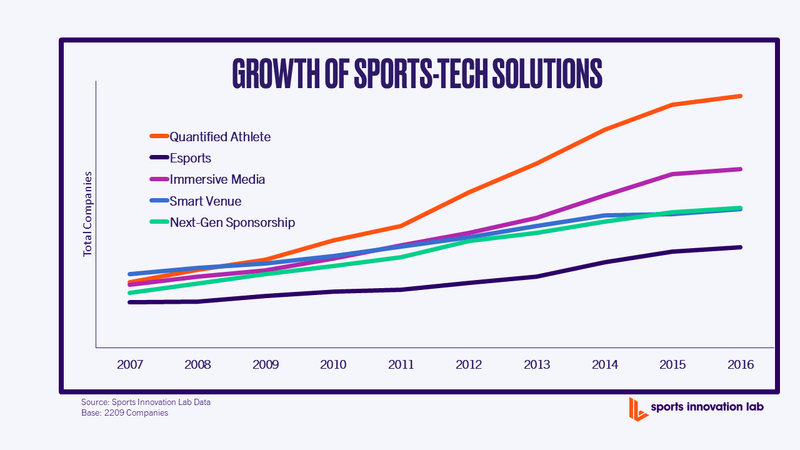 At the Sports Innovation Lab, we saw this change reflected in the proliferation of technology solutions. For the venues themselves, all of this change adds significant complexity but also provides opportunity to create differentiated and compelling technology-powered experiences that can wow fans. The rate of technology evolution presented challenges for the Organizing Committee of the Olympic Games (OCOG), as technology decisions are made three to five years before the first event begins. As available solutions changed between 2011 and 2018, so too did fan expectations: mobile ordering, contactless payments and high-speed connectivity became the norm (for social media and instant replays). Despite these challenges, the 2018 Olympics was a presentation of today’s most exciting technologies, from 8K broadcasts and 5G connectivity to virtual reality. Staying abreast and ahead of the rapidly evolving technologies and fan expectations will be essential to the success of the Games in Tokyo, Beijing, Paris, and LA. To match pace with the rate of technology evolution, the futureproof venue must be an innovation hub where technology providers test their solutions. The pressure and opportunity for what we at the Sports Innovation Lab call a ‘Smart Venue’ continues to build. A Smart Venue removes hassle, creates memories and builds a technology platform for further innovation. We see a host of new solutions adding to the fan experience. Technologies that remove hassle and create memories were on full display in PyeongChang. Many of the The Olympic Partners (TOPs) used the Games to demonstrate their technology capabilities on a global platform. I was able to see and hear about the future of 5G with Samsung, facial recognition with Alibaba, VR with Intel, self-driving cars with Toyota, robot assistants with Genie Talk, live athlete data used for performance and fan engagement from Omega, and contactless payments with Visa. Korea Telecom also developed a high-speed, low latency network to support mass video streaming and deliver Wi-Fi to 250,000 devices simultaneously. The Games provide one of the most visible platforms for global technology vendors, yet we also see new technologies being tested across venues on a daily basis. In my final duties as a member of the International Olympic Committee, I awarded the 2018 USA Women’s Hockey Team their gold medals. Standing in the centre of the Gangneung Hockey Centre, the feeling was electric. The live experience is incomparable. No substitute will ever match the in-person live experience at a venue. The remote experience is drastically improving. For those who cannot experience an event live, there are a growing number of digital alternatives. These two forces put an extreme amount of pressure on venues to make it easy and appealing for fans to attend live events, but it also creates a huge opportunity to improve access and engagement with sport. Venue operators will need to expand their innovation strategy for attracting foot-traffic and community value. Some properties are rising to this challenge by adopting their identity as an innovation hub. The San Francisco 49ers have created an innovation centre to teach local school children about Science, Technology, Engineering, Art and Math at 49ersEDU. FC Barcelona has an Innovation lab to examine the future applications of athlete data. The Green Bay Packers partnered with Microsoft to create the TitletownTech where digital solutions are developed for new market challenges. Building innovation hubs inside venues for future events, Local Organizing Committees and venue owners/operators must look beyond blueprints and budgets to create innovation centres that increase the technology IQ of the local community, and ultimately, future fan engagement.